One of the most important C that gives a diamond its fiery blaze, brilliance and sparkle is a diamond’s cut. It is the proportion, evenness and polish that maximises a diamond’s fire. The cut of the diamond that brings symmetry to the gemstone's facets and enhances its capability to reflect light. A rough diamond is usually murky and opaque, a lacklustre mass without a sparkle. It is when a skilled craftsman cut and polishes it giving it facets that reflects light that a diamond comes to life. As light hits the surface of a diamond, it bounces and reflects off the facets within a diamond giving it the sparkle that we see. This is the reason why a cut of a diamond is known as measure of light’s performance. A well cut diamond with precise angles, location size and shape of the facets achieves high level of fire, vivacity, and durability. If not cut well, even a high grade diamond will be look dull. As legends have it the very first diamonds were found in India though kept in uncut and unpolished condition. They were considered sacred stone possessing immense power. It was not until 14th century that diamonds were cut and polished, though it was mostly point cut following the shape of the stone and polishing to give it some shine. Table cut was the first major faceting technique started in 14th century. With 15th Century came the discovery that diamonds can be cut using its own dust and so began different techniques of cutting. In 1476 a master diamond cutter experimented with adding triangular facets to diamonds to bring out their sparkle and thus evolved the modern diamond cutting techniques.This early form was called the rose or antique cut which has large and open facets that give out a soft sparkle. The first every diamond engagement ring in the history was given to Mary of Burgundy by Archduke Maximilian of Austria in 1477. The ring was set with a number of point cut oblong shaped diamonds set in the letter “M”. The history of diamond cutting officially began in the middle ages when diamonds became fashionable in Europe. The invention of new diamond cutting tools in 16th century, invoked the early bruiting, faceting, and polishing of diamonds by European artisans. Over the time diamond cuts became standardised due to the craftsmen’s efforts to observe analogous cutting techniques. Today the use of machines to cut diamonds ensures maximum precision. Diamond Cut is the most complex and technically challenging “C” to analyse. 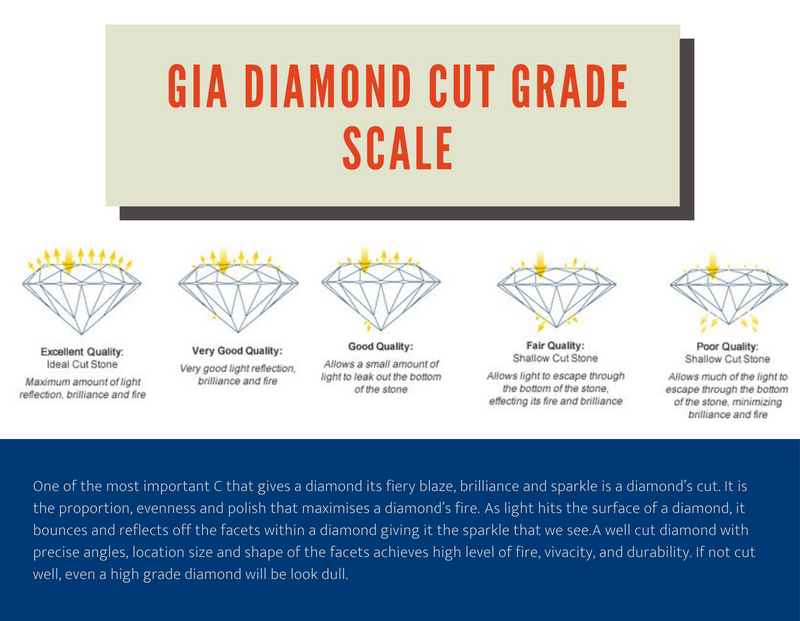 This is the reason why World’s Foremost Authority in Gemmology, GIA has standard grade-setting determinants, taking into consideration the proportion of facets, the precision of angles and sides that influence the diamond’s face-up appearance. It helps evaluate how effectively a diamond interacts with light. So it is the diamond cutter’s utmost priority to deliver such a precise workmanship that the gemstone’s proportion, symmetry and polish brings out the radiance and magnificent return of light associated with a diamond. Excellent: This is the highest grade representing world’s premium diamonds that form the top 3% of all diamond supply. Diamonds with this grading have maximum fire and brilliance. Diamonds with this grade are so impeccably crafted that it allows almost negligible amount of light to escape, creating unmatched brilliance and sparkle. Very Good: This is the second most coveted grade and in normal lighting it appears almost equivalent to an excellent cut diamond. A very well cut diamond allows very little light to escape, reflecting most of the light penetrating the diamond and creating superior fire and brilliance. Ranking amongst top 15% of the gemstone quality, a diamond with a very good cut is your best option at lower price. It also allows you to maximise other characteristic like carat, clarity and colour to fit within your budget. Diamonds with a good cut reflects most of the light that penetrates the diamond giving it a high degree of sparkle. Though it has some leakage which might lead to uneven proportions with slightly jagged dark and bright areas than excellent cut diamonds. This grade diamond is limited by its scintillation but overall possess an above average sparkle. Forming 25% of total diamond production, a good grade diamond certainly gives good value at a lower price, as compared to their excellent and Very good grade counter parts. Because it gives such a wide proportion reflection and unique pattern, sometime craftsmen intentionally give a diamond good grade cut to infuse a peculiar style. Very Poor:As the name suggests this is the lowest grade with diamonds leaking significant amount of light which is a result of too shallow or deep cuts. They are lacklustre and do not meet the minimum light performance determinants by Four Mine’s. Visually least appealing of all, it is recommended to avoid purchasing these diamonds. Often people misconceive a diamond’s cut as shape (round, emerald, princess), however a diamond’s cut is really about how well diamonds facets interact with light to give you the sparkle. This light’s performance is based on determinants like reflection, refraction and dispersion. When light hits the surface of a diamond, not all of it penetrates in and then bounce off the inner faces. Some of the light reflects back immediately off the surface. It is noted that approximately 17% of light reflects backs. However if the facets are too large, deep or shallow, light may not reflect back making the diamonds look dull and inappeasable. Ideally a well cut diamond allows the light to penetrated through surface, bounce and bend around the different facets, and then reflect back to our sight. This is what gives the diamond its brilliance. This notion is called refraction. An ideal diamond scores 2.41 on the refractive scale, giving it the typical radiance we all covet for. Often wondered what it means when they say fire within a diamond? The typical sparkle of the diamond which not only throws off black and white shine but also prism like rainbow colours that gives it the “wow” effect is what we refer to as the fire within a diamond. This fire is the result of dispersion. When the light penetrates within the diamond’s surface and refracts it creates a prism like effect because of its various. A diamonds dispersion is 0.44. This scale of dispersion is what makes diamonds rarer than other gemstones that lacks the same intensity of dispersion. Visually, Step cut such as Emerald Cut and Asscher cut are much cleaner cuts, and have facets that look like stairway when seen from the above. Though a step cut looks more elegant with gemstones like emerald sapphire and ruby, they look equally beautiful with diamonds. One of the most elegant cuts, it makes the diamond look bigger and maximises its scintillation. Though they possess a serene beauty, because of fewer facets and angles, they tend to reflect less light than brilliant cuts. Round cut or princess cut are the best examples of brilliant cuts. They possess immense fire and maximum sparkle. Unlike the straight facets of step cut, brilliant cuts have more facets and angles that are triangular and kite shaped. This unique feature is the reason for its superior luminosity and scintillation. Polish and symmetry are two other factors that contribute to the luminescence of the diamond. Polish is the smoothness of the surface of the facets. Even a slight unevenness of the surface can affect the performance of light and hence the cut of the diamond. Symmetry is the evenness of shape, size, angles and location of the facet. Even a slight error in either of the attributes affect the cut grade. Pricing of diamonds are drastically affected by cuts of a diamond. Depending up on the grade of the diamond cut. Just like every increase in carat raises the cost, an Excellent cut can gain up to 5 to 10% premium over its lower grade cut, i.e. Very Good cut. Similar goes with other lesser cut grades. However this is only applicable to round cut. GIA does not specify grades to other fancy cut other than round. Reason being that fancy cuts have a wide range of proportion of facets that enhances the brilliance and fire. Diamond is made of several parts, technically engineered in defined setting and location to maximise the light’s performance and enhance the sparkle. Cut grade of a diamond is defined taking into consideration an aggregation of all these parts. The table is the flat facet of a diamond that allows light to penetrate within and reflect back with a sparkle. It is the largest facet on a cut diamond, about 54% to 61% in a round cut diamond. Table should always be in the right proportion. A larger table cam make the diamond look bigger but then the reflection is more than the refraction which dwindles the fire. The crown refers to the top part of the diamond extending upwards from the girdle to the table. It is the height of a diamond from a profile view. Since crown is where the maximum light penetrates from, it has to be angled accurately so that light enters, refracts against pavilion and reflects back to maximize the brilliance and fire. An idea crown of a round cut diamond should be angled at approximately 35 degree. Too shallow and it ends up looking like a part of the table. Too steep crown affects penetration of light reducing the sparkle. The pavilion is that portion of a diamond that that begins at the girdle and tapers downwards to meet the culet. It is the bottom part of the diamond. It is pavilion’s job to refract the light that enters through the crown, so it is crucial that pavilion is faceted and angled accurately to enhance the sparkle. Ideal angle of pavilion is 40 to 41.6 degree. If pavilion is not angled correctly, light leaks out and diamond loses its sparkle. The widest edge of the diamond where the crown ends and meets the pavilion is called girdle. The idea girdle range is thin and slightly thick. Too thin girdle tends to chip off the edges, and too thick creates girdle reflection within the diamond that dwindles the sparkle. Culet is the bottom tip of the diamond where all the facets of pavilion meet. It closes off all the facets so that light does not leak out and refracts within to create the sparkle. Now-a-day culet are usually pointed edge. Since culet is the thinnest part of a diamond it is prone to chipping off from an impact. Depth of a diamond is referred to the total length of a diamond, which is measured from the tip of the culet to the table. 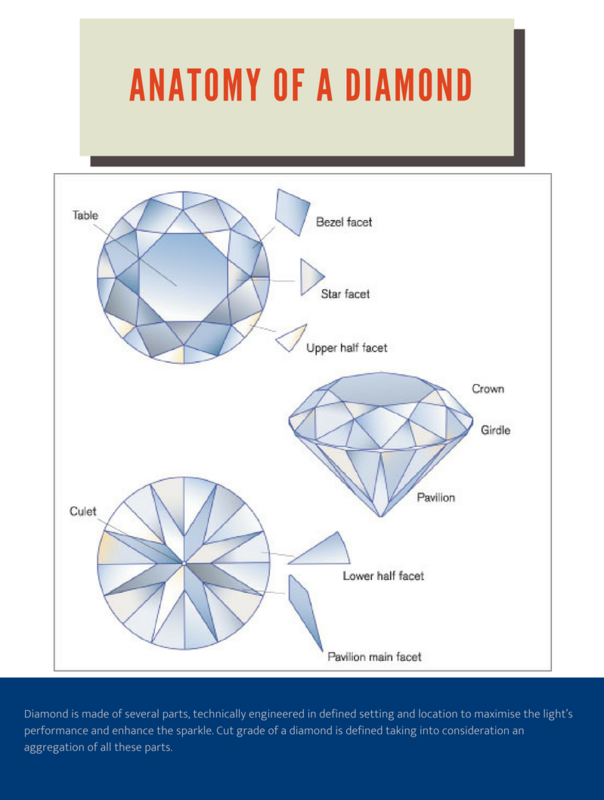 Depth is an important aspect considered while determining the cut grade of a diamond. An ideal cut diamond has precise depth, not too deep and not too shallow. If the cut of the diamond is too deep i.e. the distance from table to culet is larger it leads to leakage of light. Also a deep cut diamond looks smaller even if it is of more carats as the weight of diamond is held in the depth. Too shallow cut also leads to seepage of light. Though I shallow cut is preferable as it make diamond look bigger. But if you choose too shallow a cut, you might be compromising on the sparkle. An ideal round cut diamond should have a depth of 59% to 62%. Cut is the second most important C to be taken into consideration right after carat. A big diamond is of no use if it is lacklustre. What makes diamond so desired is its brilliance, sparkle and fire. All the factor that are achieved only with a diamond’s cut. - Goes without saying that excellent cut are most preferable of all but come with a huge premium. An excellent cut grade with maximum measurements that shows off a slightly wider spread gives you the best sparkle and size. - What one can do is choose a “very good” cut instead of “excellent” as the difference in the sparkle between the two grades is quite subtle, only evident to the naked eye when both grade cut diamonds are placed side by side. - If one is on a tighter budget, we suggest go for a fancy cut as GIA grading is not applicable to these cuts. One can achieve the similar sparkle in a lower grade too. In fancy shapes excellent cut is rarely obtained. - Lastly, try to maximize the cut grade, as the fire and brilliance can easily mask the clarity and colour shade. If you are on a tighter budget, one can choose a slight smaller carat with excellent or VG grade to get the optimum value.